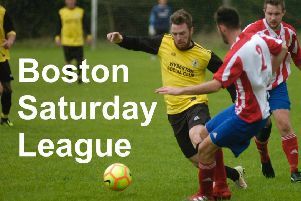 In the Boston Saturday League’s Workforce Unlimited Premier Division, Railway Athletic travelled to Ruskington Rovers and left with three points in a close 2-1 win. Wyberton Reserves did not leave with three points after their travels to Coningsby. The hosts put five past the visitors while Fulbeck, Billinghay and Swineshead also claimed victoreies this weekend. There were only two games in Division One, where Sibsey moved to top of the table after a 5-1 victory at home to Pointon Reserves. Old Dons also won at home, 6-1 against Swineshead Reserves. In Division Three, Benington Reserves keep up their good form after putting six past Swineshead A.
Eagle United also stuck to winning ways in a 5-1 victory against Old Don Reserves. Boston College Reserves travelled to Fosdyke Reserves and left with three points after a 5-1 win. In the Challenge Cup, Skegness Town A put 10 past Colsterworth. FC Hammers won 4-2 at Boston College and Park United kept up their good with a close 1-0 win against Holbeach Bank. Kirton Town, Skegness United, Friskney, JFC Seniors and Woodhall Spa United also earned wins in their games to progress to the next round.